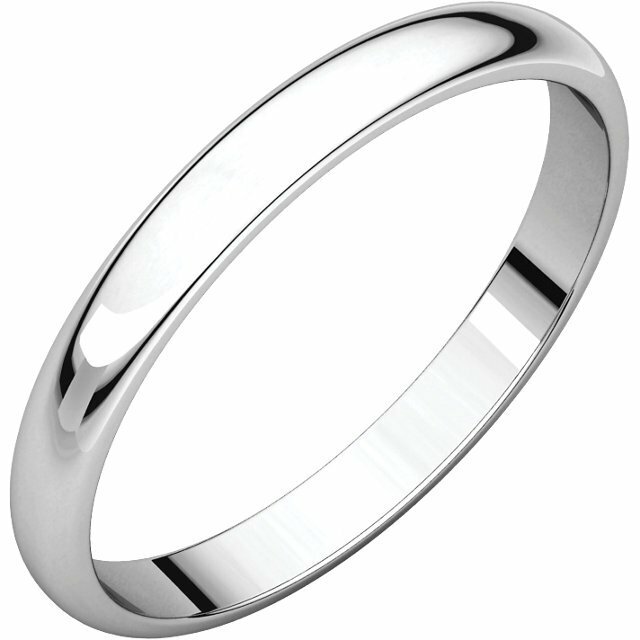 Platinum Plain 2.5 mm wide high dome half round Wedding Band. The ring is completely polished. Different finishes may be selected or specified. We had some trouble determining the ring size using the plastic ring samples but once the ring size was established the transaction was fast and easy. The shipping package was suitably anonymous for securitys sake. The ring was beautiful and the ring box was a very nice touch. My plain 10mm gold band was both beautiful and a perfect fit. I especially like the ComfortFit feature that makes the ring much more comfortable and an important feature with a wide band. Lost my wedding ring again and contacted Wedding Bands. They had a record of my prior purchase and were extraordinarily helpful and quick about sending a replacement. Price is right. Quality is right. Service is top notch. What is there not to like? Next time i will engrave my telephone number on the inside!